Xbox One X is Microsoft's £449 4K HDR games console | What Hi-Fi? Microsoft's latest games console offers native 4K HDR gaming, Ultra HD Blu-ray playback and Dolby Atmos audio. Xbox's Project Scorpio finally has a name. 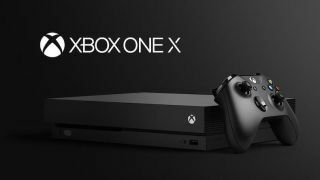 At the E3 electronics entertainment expo in Los Angeles, Microsoft officially unveiled the Xbox One X, which goes on sale on the 7th November for £449 ($499). As expected, the Xbox One X can deliver 4K HDR gaming at 60fps (frames per second) and doubles as a 4K Ultra HD Blu-ray player. It's also compatible with Dolby Atmos audio straight out of the box. MORE: What is HDR TV? Microsoft claims the Scorpio processor inside the Xbox One X (hence the 'Project Scorpio' name) is the most advanced processor to power a console and that, despite all the power and next-gen internals, the 'X' is actually the smallest Xbox yet. It boasts a custom eight-core CPU running at 2.3GHz, which claims to be 31 per cent faster than the Xbox One. The GPU is made up of 40 custom compute units running at 1172MHz, allowing the 'X' to hit its goal of delivering six teraflops of processing power, way above the PS4 Pro's 4.2 teraflops. The One X also gets a significant bump in memory with an allocation of 12GB DDR5 of RAM. The console will be backwards compatibile with Xbox One accessories, while older Xbox One games will be compatible and should benefit from faster load times too. There will even be backwards compatibility with some games launched for the original Xbox. Microsoft also claims you don't even have to own a 4K TV to see the benefits of 4K gaming on the new Xbox. It points to the One X's 'supersampling' and its ability to make 4K games look great on a non-4K TV.